Look at this famous picture of a cosmic object called the Eagle Nebula. Can you tell how many columns are in this picture? Can you tell which ones are in front of the others and which are behind? A big problem for astronomers is that they can’t fly out to explore cosmic objects beyond our Solar System. Instead they can only see them as flat pictures on the sky instead of three-dimensional objects. Three-dimensional (or 3D) means that something has three dimensions: height, width and depth. Imagine the looking at a model of a boat and then looking at a picture of the same boat. You can tell so much more about the boat with the model than a flat picture. But despite the difficulties of being stuck on earth, astronomers have just completed the first 3D image of a famous astronomical object called the Eagle Nebula! The Eagle Nebula is made up of several enormous columns of cosmic gas and dust where massive new stars are forming. Now you can experience this object in amazing new detail, as if you were flying over it. 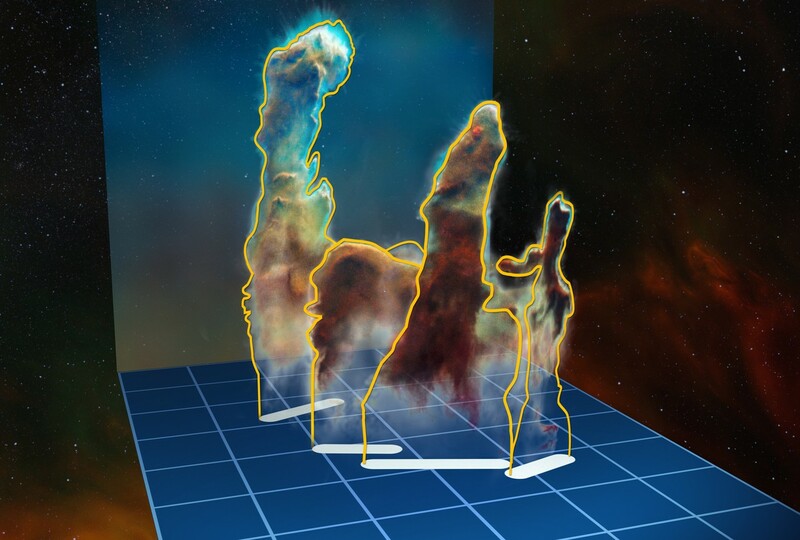 The new image shows that the Pillars of Creation are actually made up of a four separate columns that only appear part of the same object from our place on Earth. Astronomers often call time the Universe’s fourth dimension.